Goodreads says, "From New York Times bestselling author Elin Hilderbrand, comes a novel about the many ways family can fill our lives with love...if they don't kill us first. It's wedding season on Nantucket. The beautiful island is overrun with summer people--an annual source of aggravation for year-round residents. And that's not the only tension brewing offshore. When one lavish wedding ends in disaster before it can even begin everyone in the wedding party is suddenly a suspect. As Chief of Police Ed Kapenash digs into the best man, the maid of honor, the groom's famous mystery novelist mother, and even a member of his own family, the chief discovers that every wedding is a minefield--and no couple is perfect. 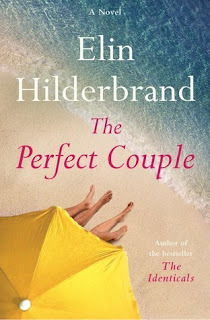 Featuring beloved characters from THE CASTAWAYS and A SUMMER AFFAIR, THE PERFECT COUPLE proves once again that Elin Hilderbrand is the queen of the summer beach read." Greer Garrison, a famous mystery author, has spent the past year helping to plan her son's perfect Nantucket wedding. Things aren't going that well for her writing career currently as she has a deadline looming, but the wedding is going to be spectacular. Her son, Benji, is marrying the woman of his dreams, Celeste, so what could go wrong? Well, things go spectacularly wrong when Celeste's best friend and maid of honor turns up dead the morning of the wedding. Celeste finds her and is unable to recover; she is sent to the hospital to be treated. Enter stage left, the Nantucket police and as they uncover what exactly happened that night, more and more secrets float to the surface. Maybe Benji's wealthy family isn't as perfect as they appear? Elin Hilderbrand has long been known as writing fantastic beach reads featuring family drama. Well, The Perfect Couple delivers that and more with a side of a murder mystery. Celeste is an interesting character in The Perfect Couple. You would assume she would be extremely happy since she is getting married, but she is hiding some major secrets. As readers slowly find out the truth, it gets harder and harder to always agree with her choices. Nonetheless, Celeste isn't your typical rich, spoiled woman that Benji would date. She comes from a modest background, has a job with a zoo, and is close with her humble parents. Despite my hesitations, I really liked her and felt for her once I figured out her "problem." On the other hand, her best friend and maid of honor, Merritt, is a hot mess in The Perfect Couple. Although she may be a good friend to Celeste, she likes playing with fire and is also is hiding some MAJOR secrets. I don't want to give anything away, but it's a bit of a disaster. Just when you think Merritt has it figured out and maybe, just maybe she might be able to get out of her latest mess, things go south for her in a major way. The cast of characters at the wedding were all interesting in The Perfect Couple. Whether the chapter was from Greer's point of view, the police chief's, Merritt's or any of the other characters, it was all very entertaining. I liked trying to piece together the puzzle with tidbits from each character's point of view. You know how weddings always bring out drama...well, Hilderbrand brought it alllll out this time with a side of foul play. And oh, the secrets!!!!! Speaking of secrets.....what I liked most about The Perfect Couple was the multi-layered secrets. Not only was it a fun novel in that it's about a wedding set in Nantucket, but it was also a whodunit. I have to say, I didn't see all the twists coming! Hilderbrand out did herself! So, if you are looking for a mystery that is also a beach read, look no further. I didn't enjoy Hilderbrand's last novel, but this one is back on track and a sure winner. So glad you enjoyed it! I have this on hold at the library and am eagerly waiting to read it! I hope you like it! I enjoyed it wayyyyy more than her last novel. I thought she did a great job with the murder mystery! Thanks for visiting, Michele! I am so hit or miss with Hilerbrand - I love the settings of her stories, but the characters are often obnoxious and/or have no morals whatsoever. But, I still continue to read her books! I know! Her last novel was a flop for me, but this one was fun! A great beach read for sure! Thanks for visiting, Angela!